José de Sousa Saramago was a renowned Portuguese poet, novelist, journalist and the recipient of the Nobel Prize in Literature in 1998. He was born into a family of landless peasants in Azinhaga, a small village in the Portuguese province of Ribatejo, which is at about a hundred kilometres north-east of Lisbon. His impoverished parents couldn’t afford to send him to grammar school and sent him to a vocational or technical school when he was 12. Saramago was mostly raised by his countryside grandparents while his parents lived in Lisbon and did temporary jobs. His illiterate grandparents instilled in him the passion and love for nature, folklore and fantasy. After completing his grad studies, Saramago started working as a car mechanic for two years. Later, he worked as a translator, and then a journalist and eventually went on working as as an assistant editor of the newspaper Diário de Notícias. In 1974, after the democratic revolution in the country, he quit the job. At the age of 23, he published his first novel after which he stopped writing for almost 30 years during which he worked at a welfare agency, a garage, a printing company, and did several other odd jobs. His first novel was Land of Sin which was published in 1947. 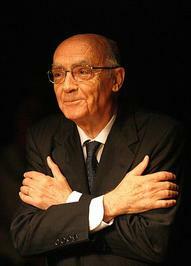 However, José Saramago came in the limelight in his sixties. The translation of his novel in 1988 as Baltasar and Blimunda by Giovanni Pontiero brought him huge attention as well as worldwide readership. The novel is about two young lovers a wounded veteran and a sorceress’ daughter in Portugal during The Spanish Inquisition. They escape their situations in a flying machine power-driven by human will. This novel was awarded the ‘Portuguese PEN Club Award’. Saramago’s another novel, The Gospel According to Jesus Christ in 1991 brought him huge criticism and controversy from Portugal’s Catholic community because of him portraying Jesus otherwise. As a result, Saramago was forced to leave the country along with his wife the Spanish journalist Pilar del Rio and live at the Canary Islands. Some other subsequent works of Saramago are Manual de pintura e caligrafia in 1976 (Manual of Painting and Calligraphy), Historia do cerco de Lisboa in 1989 (The History of the Siege of Lisbon), Ensaio sobre a Cegueira in 1995 (Blindness), Todos os nomes in 1997 (All the Names), O homem duplicado in 2002 (The Double), As intermitências da morte in 2005 (Death with Interruptions). His novel Claraboya (“Skylight”), which was actually written in 1950, was posthumously published in 2012. Besides, Saramago wrote several plays, poetry, libretti, diaries, and travelogues and many volumes of essays, short stories, and autobiographical works. His memoir As pequenas memórias in 2006 (Small Memories) highlights his childhood. Saramago was widely known for his surrealist experimentation and allegory, and was the first Portuguese-language writer to win the Nobel Prize in Literature in 1998. Over two million copies of his books have been sold in Portugal alone and his work has been translated into over 25 languages.